City Center Location with Stunning Views. Overlooking Galway Harbor. 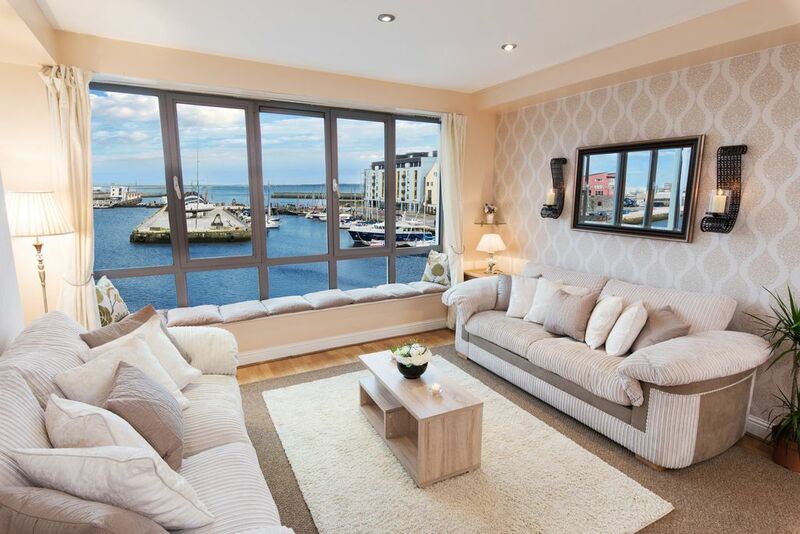 It features a balcony overlooking Galway Bay, breathtaking views throughout the apartment. A full host of entertainment options. Located in a prestigious location. Located 150 meters away from the main shopping street of Galway city "Shop Street" while the center of nightlife activity in Galway "The Latin Quarter" is 100 meters away. Located on the waterfront right in the heart of the city center surrounded by restaurants, pubs and shops. It has breathtaking views of Galway bay. It is the ultimate in Galway living. Overlooking Galway Harbour. Located 150 meters away from the main shopping street of Galway city "Shop Street" while the center of nightlife activity in Galway "The Latin Quarter" is 100 meters away. It features a balcony overlooking the Harbor giving breathtaking views throughout the apartment, Professionally decorated, the apartment features a luxurious interior with all of the furniture being focused on comfort. On Entering the Apartment you are hit at once by the magnificent view out over Galway bay enabled by the large windows. Fully equipped kitchen, A whole host of In-house entertainment to keep the whole family occupied, a TV with SKY satellite connection, dvd player, High speed wireless internet access , For the long summer days there is a Barbecue on the balcony. Accommodation consists of two double bedrooms and one twin bedroom which can be made into a double bed on request. There are two double sofa beds in the living room. Sleeping 10 in total. There are two bathrooms. The apartment has a south facing balcony, a perfect space to relax and enjoy the Atlantic views or entertain friends. Ideal for a stay in Galway be it for a couple of nights or a month. We offer a service of procuring any food & drink provisions you require. Send us a list and we will ensure that its waiting in the apartment ready on your arrival. Secure gated parking available for one car included in rate with additional spaces available both covered and uncovered in a parking right outside the building. Apartment is very secure with a key card needed to enter the building from the street and a code to gain access to the top floor. All linen and towels provided. We provide you all the amenities that you need to enjoy your stay. It's the little touches that matter the most, we think. Ireland's a rainy country, so we've provided umbrellas for your convenience. We provide a guide to recommended attractions & activities available in Galway, food delivery options, restaurants, bars and a gym. The apartment caters to groups, the check in and check out was easy, the garage parking is tight for a large van but appreciated, the pantry well stocked and ample welcome items were a treat. The rental was a quick turnaround from previous renters so not spit spot tidy but after check out, we encountered an issue leaving Galway, the staff and the housecleaners vacated the unit to give us more time to sort out an auto rental issue with ease. Deeply appreciated, thank you! The location was unbeatable and coupled with the view of the port made our trip to Galway fantastic! The location is great with wonderful views and very spacious and well equipped. I have stayed all over ireland over the years in homes and this was one of the nicest. Great place with even better location! Perfect for our large group. can be the perfect base for your Ireland holiday. Just about every part of the country can be got to within 2-3 hrs from here. Dublin may be the official capital of Ireland but there is no doubt about the cultural capital of Ireland, Galway. Galway really has everything. Its said that Galway is the gatekeeper of the Irish language and culture, where people can truly explore the real Ireland. Galway is famous for its spirited nightlife, busy cultural scene and extensive shopping. Galway is also a city of festivals and special events including the Prestigious round the world Volvo Ocean Boat Race Finishing Port, Guinness Oyster Festival, Galway Horce Racing Festival, Salthill Airshow, and the acclaimed Galway Arts Festival. Some leisure activities and amenities. * Amenities include Beaches, National atlantaquarium, Salthill promenade, Indoor Swimming pools and Leisure Centres, Multiplex Cinema, Bowling, Coole Park Visitors Centre, Connemara National Park, Cruises on the river Corrib, (Irelands largest lake) and a visit to many of the famous landmarks, such as Connemara, the Burren, Kylemore Abbey The Cliffs of Moher, Bunratty Castle & Folk park and the Aran Islands are all on the doorstep of Galway. Sports enthusiasts can enjoy an endless array of activities including watersports in Galway bay, tennis, horseriding, walking tours, cycling, greyhounds, horseracing, go-karting, bowling, river & deep sea angling, Ireland's 18 hole championship golf courses. *Aran islands* - It is a place steeped in immense cultural heritage and history. Gaelic language is the first language of its residents. It is considered the foothold of Irish culture. *Connemara* - Has long been regarded as the real emerald of Ireland. 'Connemara' is a savage beauty', Oscar Wilde* A visit to Ireland and Connemara is not complete without experiencing the beauty and tranquility that is Kylemore Abbey & Garden. *The Burren* - A unique limestone plateau,It contains dozens of megalithic tombs and celtic crosses and a ruined Cistercian Abbey from the 12th century, Corcomroe. This area is especially beautiful in spring with its abundant rare wild flowers. * The Cliffs of Moher * - Are 214m high at the highest point and range for 8 kilometres over the Atlantic Ocean on the western seaboard of County Clare.O'Brien's Tower stands proudly on a headland of the majestic Cliffs.From the Cliffs one can see the Aran Islands, Galway Bay, as well as The Twelve Pins, the Maum Turk Mountains . *Bunratty Castle and folk park - A chance to experiance the most authentic medievil fortress in Ireland including a 26 acre 'living' medievil irish village in a rurual setting. Built in 1425, the castle houses 450 medievil artifacts and furniture. Golf Information: * Galway Golf Club, Salthill. This popular course with its well designed rolling fairways are bounded by mature woodlands and the spectacular seascape of Galway Bay. * Connemara Golf Club Ballyconneely, Clifden. This is a sand based links with its back nine described as the equal of anywhere in the world. We will be more than happy to provide you with all the information you need to ensure you have an unforgettable holiday.